ShareHolder Finder v0.9.3 is now released!!! Check Product Page for more details. Find the companies owned by your favorite shareholders!!! Identifying the new investments from proven and veteran investors can lead to a new investment opportunity for the small investors. ShareHolder Finder v0.9.4 software scans through the quarterly shareholding pattern of BSE listed Indian companies and filter-out the ones which are owned by a list of shareholders. Standalone application (No installation required–just Download and Run). Light-weight (around 1 MB size only). The application works with any Windows OS. No third party components or extra installs required. The application analyses the LIVE data available from BSE website. So NO DELAYS to get the data during shareholding pattern submission period and NO ERRORS. Provision to search multiple shareholder names. Supports following shareholder categories: Public Only/ Promoter and Promoter Group Only/ Both. Supports searching of previous quarters. New quarters are added automatically. 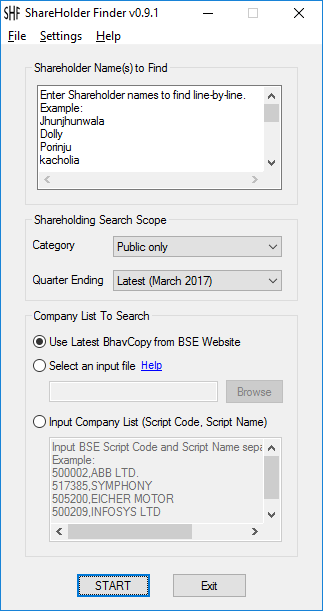 Company list can be retrieved from latest BSE BhavCopy or from an input file or even user can directly enter the list. User friendly HTML Output Report. Copyright © 2016 Automation Developers. All Rights Reserved.